Grayrock Village at Lake Ridge is a renowned active lifestyle neighborhood in Fort Mill, South Carolina. Located within the master-planned community of Lake Ridge and next to the beautiful Lake Wylie, Fort Mill puts golfing, city parks, a marina and a beautiful natural environment at the doorstep of Grayrock Village residents. Right next door, historic Fort Mill provides another appealing ambiance. The community of Lake Ridge provides a mature, natural environment with resort amenities, such as a swimming pool, tennis courts and paved walkways. The main hub for activities in the community is a 7,000 square-foot clubhouse in the master-planned community of Lake Ridge. Inside the beautiful clubhouse there is a roomy gathering area with a fireplace and catering kitchen which makes the ideal setting for get-togethers. The clubhouse also provides a hobby and game room where residents can meet for any of the numerous clubs. For residents who want to get a good workout in, the state-of-the-art fitness center at Lake Ridge is second to none. Outside, residents can stroll, run or bike along miles of 8-foot-wide, paved walking trails that wind through Fort Mill and Catawba River Park. Additionally there are two tennis courts for those who enjoy a match. D.R. Horton and Tribute Homes started building the single-family residences at Lake Ridge in 2009. Both new and resale houses are available with two bedrooms plus den to five bedrooms and two to four-and-a-half bathrooms. Grayrock Village is one of eight villages situated throughout Lake Ridge. D.R. Horton has created 11 different one and two-story home plans for the master-planned community of Lake Ridge, all with roomy kitchens, breakfast nooks and covered patios. Options like side-load garages, sun rooms and second master suites are available. The D.R. Horton homes range in size from 2,179 to 3,905 square feet. Tribute Homes has designed four different home plans for Lake Ridge ranging in size from 1,644 to 1,756 square feet. These low-maintenance residences by Tribute Homes have two to four bedrooms and two to three bathrooms. Optional guest suites and loft areas are available. Houses by both D.R. Horton and Tribute Homes also include 2-car garages. Residents also can expect a host of customizable options inside, along with a choice of exterior materials, too. People who enjoy a blend of nature and a hearty lifestyle are drawn to Lake Ridge at Fort Mill. In addition to the mature, natural beauty, the area is primed for fun. Golfers can head to Tega Cay Golf Club's 27 holes of championship golf and lighted tennis complex. Back at the Lake Ridge clubhouse, residents often gather for everything from playing cards to discussing books to pursuing hobbies. With Lake Wylie and the Catawba River close by, Lake Ridge is a sanctuary for folks who like boating and fishing. Lake Wylie has a public boat ramp right next to Lake Ridge, plus several public marinas for docking your boat. Within 10 minutes, the Anne Springs Close Greenway brings you 2,300 acres of forests, lakes and trails for everything from walking to horseback riding. For those who like a faster pace, Carowinds the Carolinas' largest theme park is a quick drive. It's also nice to know that Piedmont Urgent Care Center is only about five minutes away. Fort Mill and Tega Cay offer easy access to I-77, making Charlotte about 25 minutes from home. Charlotte Douglas International Airport is about 20 minutes away. Carolinas Medical Center, Caroline Place Mall and Ballantyne are all just a quick drive, too. Residents of Grayrock Village have access to the amenities offered throughout the Lake Ridge community. 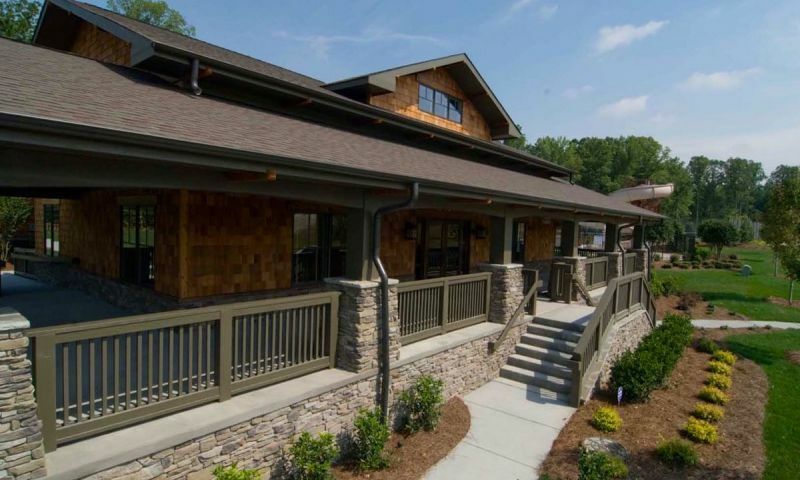 Lake Ridge Clubhouse - 7,000 Sq. Ft. There are plenty of activities available in Grayrock Village at Lake Ridge. Here is a sample of some of the clubs, activities and classes offered here. Tribute Homes offers four low-maintenance single-family models. These models are available between 1,644 and 1,756 square feet and offer optional loft spaces. D. R. Horton has created 11 different one and two-story home plans for Lake Ridge, all with roomy kitchens, breakfast nooks and covered patios. Options like side-load garages, sun rooms and second master suites are available. We own a DR Horton home here and are very happy with it. My husband and I are in our early 40s so it's nice to have the clubhouse and amenities without waiting to hit 55 to enjoy living in a nice community like this. We bought a Cumberland ranch plan here and really like the flow of the house. It's open and airy and has plenty of space for our lifestyle. I work from home so we turned one of the three bedrooms into a home office and craft room. The final price was pretty reasonable although we did end up adding a few extra, more costly items. The clubhouse is nice and has everything we really wanted. It's decorated beautifully too. 55places.com is not affiliated with the developer(s) or homeowners association of Grayrock Village at Lake Ridge. The information you submit is distributed to a 55places.com Partner Agent, who is a licensed real estate agent. The information regarding Grayrock Village at Lake Ridge has not been verified or approved by the developer or homeowners association. Please verify all information prior to purchasing. 55places.com is not responsible for any errors regarding the information displayed on this website.